The QX50 is a compact luxury crossover that is available in either rear or all-wheel drive options, mated to a 325 hp 3.7-liter V6 and 7-speed transmission. The fit and finish is of a high standard although the interior is looking a bit dated. Standard equipment is decent and modern features such as adaptive lighting, intelligent cruise control and Bluetooth streaming can all be optioned. The QX50 may be getting on but it remains a well-priced, driver oriented alternative to the competition. 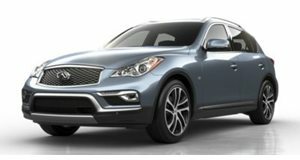 The Infiniti QX50 straddles the line between full-blown SUV and high-riding sports sedan, it sits lower to the ground than most and offers a far more focused driving experience than a traditional SUV. It has been around for a number of years starting off life as the game-changing EX35 in 2007. That was a long time ago and in fairness it has gone through a number of major revisions to keep it fresh in the face of much newer competition. Externally the QX50 still looks fresh with its LED daytime running lights and handsome lines. The signs that it has been around for a number of years are more apparent in the interior where its competitors have moved the game on. While the fit and finish is of a high quality, the dated ergonomics and small display screen betray its age. Covered in standard leather, both front and rear seats are comfortable for longer trips, and the additional rear legroom is a welcome change from earlier models. 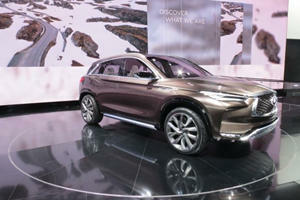 If only that increased space had extended to the cargo area the QX50 would have been a far more practical proposition. Despite the fold-down rear seats you won’t get much more into the back than a similar sized sedan. The QX50 comes into its own when it comes to the driving experience. The smaller dimensions, well weighed hydraulic steering and eager chassis place it a notch above the more traditional SUV offerings. The optional 19-inch wheels are now available separately and while they do improve handling it comes at the expense of ride quality and increased road noise. You can pick either a rear-wheel drive or all-wheel drive layout, both are surefooted in dry conditions but, as can be expected, the all-wheel drive variant is the better choice in adverse weather conditions. Consumption figures are stated as the same for both configurations however you should expect a slight dip in economy and performance for the all-wheel drive variant. The solitary engine option is the tried and trusted 325 horsepower V6, it outguns the majority of its inline-4 turbo competitors in the power stakes, although you do lose out at the pumps when you take advantage of that extra grunt. The 7-speed automatic transmission may be a bit long in the tooth but it shifts smoothly and works well with the 267 lb-ft of torque on offer. The overall feel from behind the wheel is of a lusty and eager engine, the lag-free power delivery is refreshing in this turbocharged age and at this price point the QX50 has few competitors when it comes to performance. You also get a decent amount of standard equipment including keyless entry, sunroof (moonroof according to Infiniti), rear-view camera and USB connectivity. Those wanting more can choose the Premium Package (Bose Premium Audio and Advanced Climate Control), Premium Plus Package (Bluetooth Streaming Audio and Infiniti Nav system), Deluxe Touring Package (19-inch wheels and adaptive front lighting) and Technology Package (Lane departure warning and intelligent cruise control). Those are a lot of packages and they come with a catch. Unlike most other manufactures, Infiniti insists that you tick each one before moving on to the next. This can get expensive pretty quickly and you will have to part with a fair chunk of cash if you want the latest safety devices in your QX50 as the Technology Package is the last on the list. The QX50 is a compact SUV that majors on the driving experience at the expense of some of the usual SUV traits such as a high driving position and spacious cargo area. Its major drawback however is the aging interior and the need to tick every box to get the latest safety options. These shortcomings negate its pricing advantage and may limit its appeal compared to more traditional SUVs. 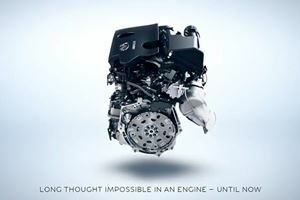 This is the biggest game changer for the internal combustion engine since the fuel injector. The successor to the oft-maligned QX50 is looking pretty darn promising.